For many years, we referred to life jackets as “PFDs” – Personal Flotation Devices. Jeesh, can the lawyers get over it? OK, not everyone in a life jacket survives. Roughly only 15 out of 16…Conversely, if you go in the water without a life jacket, only one guy comes out. The other 15 were fatalities. Let me rephrase that. A fatality is a death – let’s not mince words like “PFDs.” Life jackets save lives. This column is about that. Boaters end up in the water for a variety of reasons but the two largest – capsizes and falls overboard – comprise nearly 60% of all boating deaths. But you say you are experienced. Well, another statistic I’ve seen is this. Boaters who have over 100 hours of boating experience – and are 35 or older – and who have NOT taken a formal boating safety class – account for over half of all boating accidents. Oh, they are also responsible for over half the fatalities – deaths – too. If you haven’t taken a boating safety class yet, or haven’t taken one in a long time, email me at the address below and I will help you find one in your neighborhood. Unless you had your life jacket on when you went into the “drink,” you’re not getting it on. Unless you try this idea, which I thank friend and colleague Capt. John Konrad for detailing. In the comfort of your cabin, putting on a life jacket like a jacket is easy. You slip into as easily as your dinner jacket on the way out the door. But, you’ve fallen overboard and, by good practice, someone has thrown a life jacket in the water for you to use to save yourself until they can turn the sailboat around. There is only one problem – you will find it impossible to put on a life jacket in the water like you put it on “normally.” Most of your body will be submerged with just your head and shoulders exposed above the sea surface. You must use a simple, little-practiced method to don any life jacket in the water – which many a kindergarten teacher used to teach their little charges on how to put on a heavy winter coat in the classroom. 1. Grab the collar of the life jacket. Pull the life jacket close to you. Turn the jacket so that it floats with the front pointed toward the sky. Unclip all snaps and straps. 2. Open the life jacket all the way so that it lies almost flat on the water surface. Keep the collar close to you. 3. Thrust each arm as far as possible through each arm hole. 4. Raise both arms in a smooth, fast motion above your head and slightly back. • Kneel down next to a table about chin height. • Place the life jacket on top of the table. • Follow steps 1 – 5 above. • Practice until you can complete all steps within 30 seconds. • Train your sailing crew. Oh, They Are So Bulky! Come on, bunky, are you still using the ones from the Titanic? 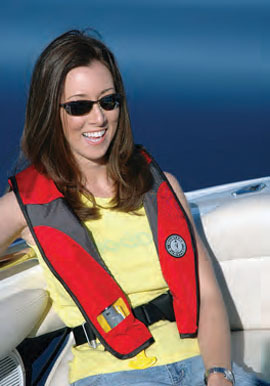 Modern life jackets come in many sizes and many colors, and are as light as a feather. You can get them in “camo” mode for hunting, you can get ones that self-inflate if you do fall in, and you can get them in matching colors.